As was posted two days ago, WorldFirst has abruptly closed its US business. Little notice was given to customers including automatically closing out all forward contracts yesterday. We assume this move was to help get the Ant Financial deal across line which we covered here. This deal is a microcosm of the current US-China political relationship. It appears that even a US subsidiary of a foreign financial services firm would not get approved to be Chinese owned or certainly not worth the time and effort trying. More broadly, for any overseas payment business putting resource into growing their US presence (read Moneycorp, OFX, Transfermate, TransferWise) is it worth all the effort? If we look at the last 10 years of cross-border M&A in the space, the trends are very clear. It’s simple. People like to buy British or Canadian and make sure you have a direct line to a banker in the US (or maybe China). Since most, but not all the companies above had a meaningful US business when acquired, if you’re building your US business, stay the course, just don’t look east when you want to sell. Just when Visa was popping the champagne, Mastercard offered 10% more and is now leading the race to buy Earthport. We opened the year with the story of this deal and how it looked to be a competitive response by Visa to Mastercard’s current strategy. Now Mastercard further strengthens its cross border offering and puts Visa two steps behind. The market caps of Mastercard and Visa are c. $200bn and $300bn respectively. Since this is a deal worth around 0.1% of Mastercard’s total value, paying a small premium to thwart a competitor may be reason enough. 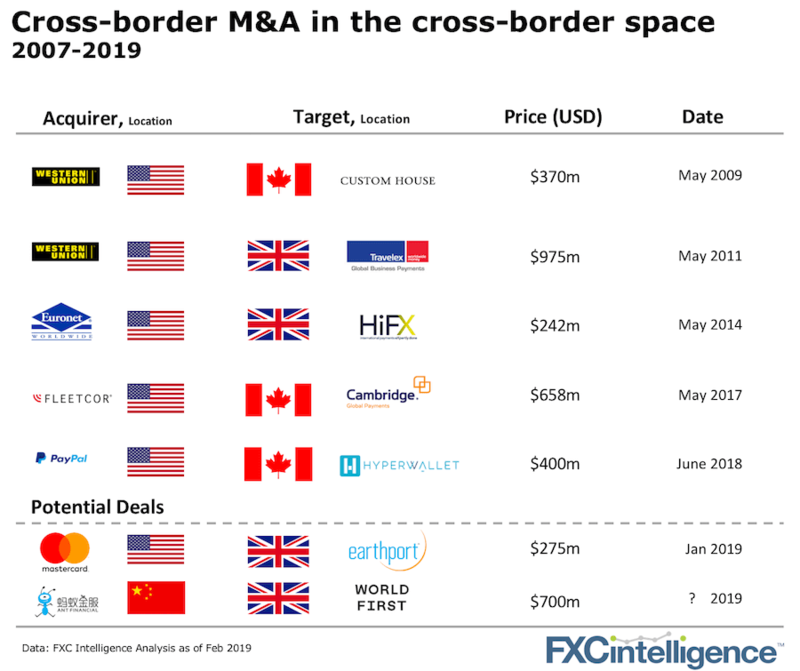 If Visa loses this one, expect a bigger cross-border play next, especially with Visa reporting yesterday a slow down in cross-border growth for Q1 2019.